Glads too tall for your garden? 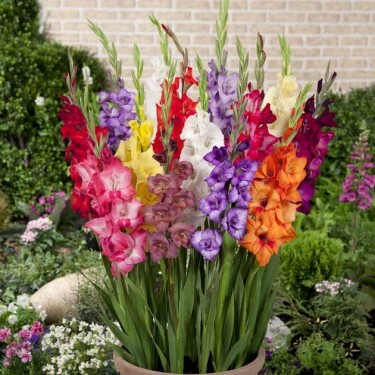 Our Rock a Bye Baby Gladiolus Mix is the answer! These dwarf cuties pack all the flower punch of regular sized Glads but grow to only 20" high. Perfect for containers. Looking for something just a tad unusual? You’re sure to turn a few heads with these dwarf Gladiolus. These pastel-coloured blooms will add a softness of hues to any cutting garden and a wonderful addition to any fresh cut bouquet! We suggest planting your Glads at intervals of 2 weeks, which will allow you to enjoy them in your arrangements throughout the season. For longer lasting arrangements make sure to cut the spike when only one to three florets are open. Plant your Gladiolus in full sun and because they're shorter than standard Glads staking is unnecessary.